Who sees all her days lived and those yet to be lived. And who holds in his hands a string of all her moments–her joys and her trials. The One who promises to twine them all into a trail toward good. Bless her in her struggles, lift her when she stumbles, and carry her in her sorrows. When she has a to-do list miles long but is worn out from starting over, show her how to simply start with the next small thing. Nothing has to be done today but the next small thing. When she’s tired out from filling countless rolls beyond wife (and mom), freshen her with the knowledge that you are a God who works in countless ways to fill her empty places, to be what she cannot. When she’s hungry for real community, provide her with friendships that last beyond state lines and country boarders, friends that feel like family. When loneliness comes close, may she feel you come closer still. When she’s depleted of resources and bare as the kitchen cabinets, fill her to the brim with your hope that says you got this, daughter, because I got you. Nourish her weary places with your Spirit. Be there for her by being there for her children, providing them with the security of home found best in people not places. Provide for her by bringing her children good, for-them friends who invite them to their lunchroom table, their neighborhood games, and their kind-natured hearts. Provide this brave woman with soul stability that relies on a steady, Rock-solid foundation (Psalm 18:2). When hard goodbyes–and difficult hellos–land on her doorstep, may she get through them by welcoming the faith and trust that walk with them. When deployment looms, may she know she is as cared for during her military husband’s absence as during his presence. Help her to release all her fears to you, the One who wants all of them (Psalm 34:4). And when her husband comes to her with hard stories from difficult places, may the ears of her heart be ready to listen as he’s ready to share. Cloak her in your mercy as she waits, waits, and waits some more. Be her mirror that reflects an accurate vision of herself so she knows she is already enough–right here, right now. When she feels no adoration for her location, may she know her assignment is authored by you–the One who determined the exact places she should live (Acts 17:26). May she know the indescribable value of her own service and sacrifice as a true hero at home. Let her know it’s okay to fall apart and that nothing is gained from having it all together all the time. And when she does fall apart, give her friends that are safe places to break wide open and share the shards of the mess. Who encourage Christ’s love between the broken pieces. And may she understand that you, Lord, turn shattered shards into shimmering beauty. May gratitude be her default reaction because gratitude precedes miracles. Because you refuse to let the hard things, the crouched-in-the-corner crying things, the hard-to-be-thankful things be wasted. And from dawn’s early light to dusk’s fading away, may laughter find her and grace feed her. And may your love protect her and your hope heal her. Download your free printable of this prayer here. Note: For flow and ease of reading, I used the feminine pronouns in this prayer. I chose feminine because most (if not all) my regular readers here at Chasing Blue Skies are (not surprisingly) women. 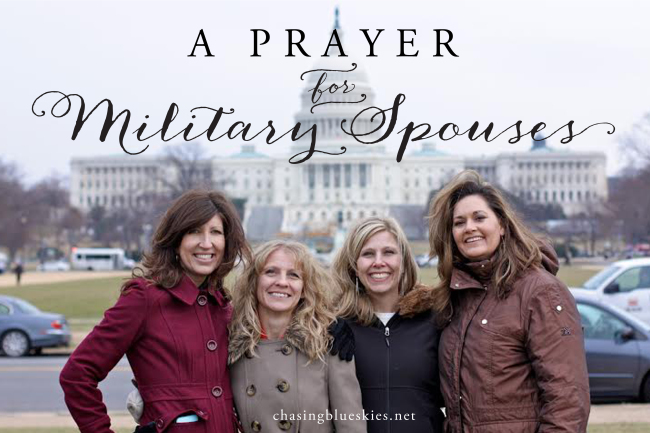 If you would like a copy of this prayer that has been written specifically for the military husband, click here. 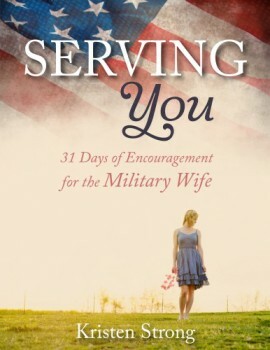 Are you a military wife looking for more encouragement? You can find my ebook written just for you here. If you have written a post encouraging military spouses in any way, feel free to link it up below. If you don’t have a blog, feel free to sing the praises of your favorite military spouse or offer a word of encouragement to them in the comments below. “When she’s hungry for real community, provide her with friendships that last beyond state lines and country boarders, friends that feel like family.” Thank you for this entire prayer, but these words specifically ministered to me today! We’re preparing for another move in just six weeks, and I’m feeling the anxiousness of a new place, but what has really been stirring in my soul is a desire for good friends. I’m very thankful for the relationships that we have all over the place, but I’m also praying for some deep friendships to be made in our new town. Thanks for helping me to remember to pray specifically for these desires. You’re a blessing! To know you is to love you, sweet girl. Praying you find those friends sooner then later (and that you have a smooth transition to your new location). Much love. Bless you Kristen for blessing the military spouses (wives)! And may God bless all military wives and protect them, give them strength and be their provision! Such a great prayer above!